What is Microsoft Hyper-V virtualization technology? Virtualization technologies have become a part of our life. Surprisingly, not many people are familiar with them. In this article, I’m going to give a detailed explanation on what virtualization is. I will take a look at Microsoft Hyper-V technology and examine it by performing the initial steps of configuration: Installation and virtual machine deployment. Virtualization is the creation of a virtual (rather than physical) version of an IT environment, including an operating system (OS), a storage device, etc. Virtualization takes place on the same hardware platform after installing specific software - hypervisor. 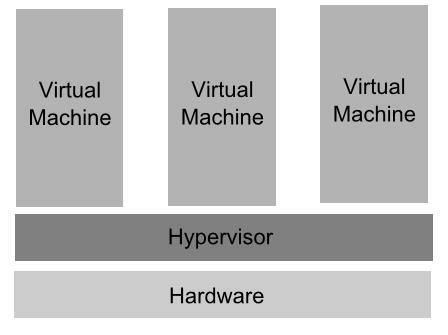 The hypervisor is an additional layer between physical and virtual spheres; it manages the system’s hardware resources so they are distributed efficiently among virtual machines (VMs). System resources are provided for VMs, and the hypervisor makes this distribution flexible — and even limited from time-to-time, depending on the current VM load and system policy. Guest software, which is used by end-users, runs on the VM as though it’s running directly on the physical hardware. Both the application and the end user may be unaware that they are working within a virtual sphere. The term "virtualization" has been around since the 1960s. However, because there were no personal computers in those days, virtualization did not become a reality until the late 1990s. Companies realized then that they could save money by moving from a physical to a virtual platform. Technologies, especially computer capacities, were growing as well. Very much unlike Moore's law (1000-times more, over the last 20 years), office tasks remained on pretty much the same level. That led to inefficient use of resources. Give you a flexible environment for various tests—and more! Sounds interesting, right? So, what is Hyper-V technology exactly? Let’s take a look at this Microsoft’s interpretation of virtualization. Microsoft could not ignore the virtualization trend. Microsoft introduced Hyper-V as a virtualization platform in 2008, and it continued to release new Hyper-V versions with new Windows server versions. So far, there are a total of four versions, including Windows Server 2012 R2, Windows Server 2012, Windows Server 2008 R2 and Windows Server 2008. Update: Recommending to read an E-book "All You Need to Know About Microsoft Windows Server 2016 Virtualization" by Clint Wyckoff to stay tuned with the technology changes that will have great impact on Hyper-V. Since Hyper-V’s debut, it has always been a Windows Server feature, which could be installed whenever a server administrator decided to do so. It’s also available as a separate product called Microsoft Hyper-V Server. Basically, Microsoft Hyper-V Server is a standalone and shortened version of Windows Server where Microsoft cut out everything irrelevant to virtualization, services and Graphical User Interface (GUI) to make the server as small as possible. Plus, without the bells and whistles, the server requires less maintenance time and it is less vulnerable, because, for example, fewer components mean less patching. Hyper-V is a hybrid hypervisor, which is installed from OS (via Windows wizard of adding roles). However, during installation it redesigns the OS architecture and becomes just like a next layer on the physical hardware (refer to pic.1). It’s simple and the same as any typical program installation. First of all, check and see which Windows version you have. If it’s Windows Server OS and newer than 2008, you should activate the Hyper-V role through the Server Manager, and then perform the installation by following the wizard. For Windows 8/8.1, check Windows 8 versions comparison, to make sure your current OS license allows you to deploy Hyper-V. Note: If you are running a Windows version older than 2008, you will need to upgrade to a newer version before you can proceed. Once the installation is complete, the computer will reboot. After it has rebooted, you will notice additional services have been installed, including Hyper-V Manager. Next, let’s go to the Control Panel, then to Administration and then to Hyper-V Manager to find out what you can do with this installation. 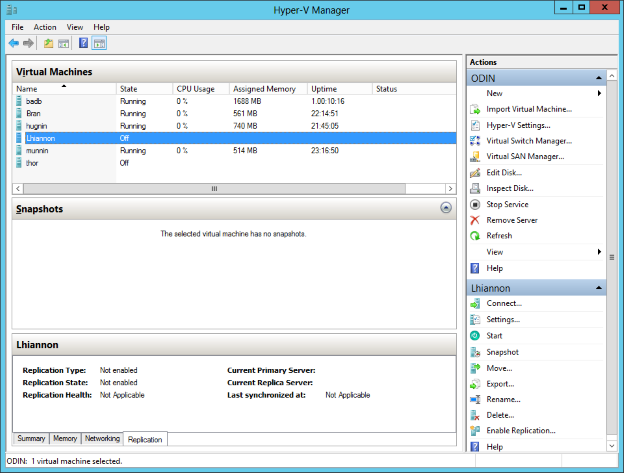 All Hyper-V management operations are available from Hyper-V Manager (pic.2). Since Hyper-V role is also integrated into the Server Manager tool, you can find some useful information there by viewing the events and services related to Hyper-V and see recommended configurations, tasks, best practices, and online resources. With Hyper-V Manager, you can create, change and delete VMs; tune virtual networking and perform additional dependent operations. Let’s make one simple operation and create a test VM right now. 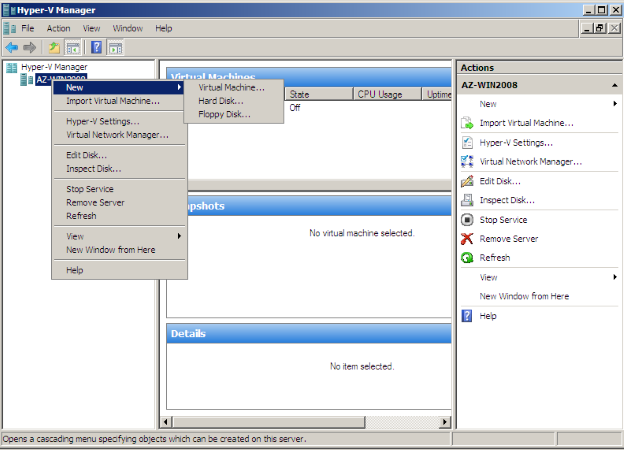 Right-click the server node in the main window, point to New, and select Virtual Machine (Pic.3). You will then see the new Virtual Machine starting. Pic. 3 Hyper-V Manager. New VM creation. You must then enter a name for the virtual machine, find a place to store it (the system disk is the default) and specify the amount of memory to allocate. Next, you will select a network adapter for VM use, create a virtual hard disk (yes, every VM needs a disk) and then define how you are going to install an operating system to VM (physical CD/DVD-ROM or .ISO image on a hard disk). You should then click Finish and your VM will be created! 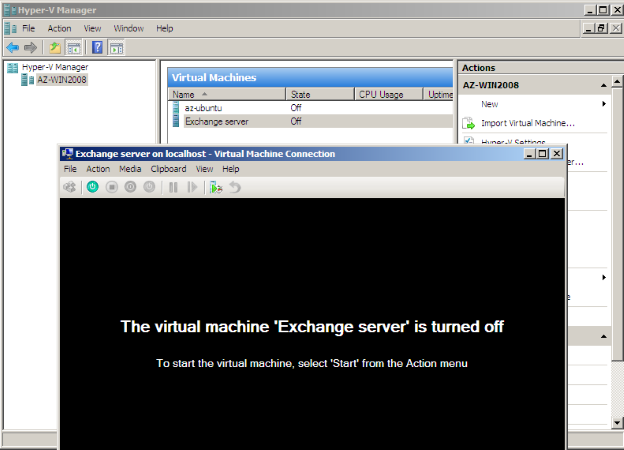 To check if the VM is working, right-click on the name of the virtual machine and then click Connect (Pic.4). Once the VM is initialized, the operating system installation should start automatically. Pic. 4 Hyper-V Manager. Virtual Machine Connection. Windows Server allows you to install one physical instance of an OS, plus some virtual machines depending on the OS version and edition. From the other side, the standalone edition of Hyper-V does not need any operating system license, but you will need to buy licenses for any instances of Windows when you install them on VMs. For example, if you have Windows Server 2012 Datacenter, you can install an unlimited number of VMs right away. To find out more information, please refer to the article about Windows Server 2012 R2 licensing. Once you begin to create or migrate workloads to Hyper-V, you’ll want to make sure everything is backed up. Veeam provides fast, reliable and affordable backup, recovery and replication for virtualized environments running on Windows Server with Hyper-V.
Virtualization and Hyper-V alone have brought to computing an entire revolution of new benefits, including hardware-resource savings, a need for less space, energy cost savings, and much more. If you have an interesting Hyper-V experience, please share it with us by posting it via Twitter. Tag @veeam in your tweet so we can discuss your experience with each other.